Electronic adjustable timer relay - Timing fro 0.2 to 1500 s in 4 ranges - 3 contacts (GAT-MT) or 4 contacts (GAT-ET) - 3 A.
Pins at the standard pitch of 2.54 mm. 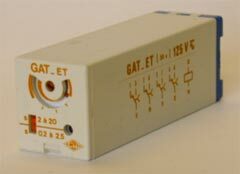 GAT relay is pluggable on the following sockets : EVB/GE, 9877, EVC/GE, 9876, ER/GE 2.8, or ER/GE. Relay equipped in its standard version with a timing range selector on front face and a red LED indicating the status of the timed contacts.